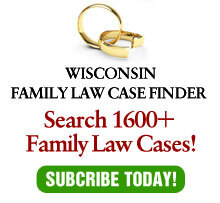 On April 3, 2012, the Supreme Court of Wisconsin issued their opinion in May v. May, No. 10AP177, which affirmed the decision of the trial court, Hon. Maryann Sumi of Dane County, on a certification from the Court of Appeals. The circuit court found that an agreement not to decrease child support for 33 months was valid and not against public policy. First, while the court gives lip service to the freedom to contract, they obviously do not truly believe in it as they continually (at least in family law cases) find it contrary to public policy. Second, as I’ve written frequently, once the basic needs of children are met, their best interests are better served by preventing conflict between the parents than by requiring one parent to pay and the other to receive the maximum amount of child support possible. If you don’t believe me, just ask any child. Third, this decision make things worse, not better (that’s not easy to do!). At least a black letter rule that ceilings are contrary to public policy and floors are not would be easy to follow. So would a holding that all child support stipulation which tie the hands of the court are contrary to public policy. Instead, as pointed out by the concurrence by Justice Bradley and the dissent by Chief Justice Abrahamson, the majority’s reasoning is circular. I would go further and say it’s self-contradictory. As best as I understand it, according to this decision, floors are acceptable, but the court can modify a floor under if circumstances so warrant. Well, if a court can modify it, then such a stipulation (which is designed to be non-modifiable) is not enforceable. The result is a decision in which an area where the court has the public policy wrong, is now also confusing.